Christ and Church proclaim life. Period. End of sentence. I’ve spend most of a career, now, preaching my way through the bible, one passage at a time, Sunday after Sunday after Sunday. And after all that time, it, still, amazes me at how little I’ve learned. Well, maybe not how little I’ve learned, as how full of meaning scripture is. Take, for instance, the passage from Luke that I just read. It’s, probably, come up a dozen times, throughout my ministry. And each time, I’ve, simply, taken it at face value and moved on. Jesus stands up. He’s handed a scroll of Isaiah. He reads and, then, sits back down. The gospel of the Lord. Praise to you, O Christ. Luke doesn’t tell us what chapter or which verses. But I just, naturally, figured he’d read it just like we do. One verse after another. Dotted ‘i’ after dotted ‘i’. Crossed ‘t’ after crossed ‘t’. But this time, this week, I followed a hint from something I read. And for the first time, I actually looked up what Jesus apparently read. And I discovered it came from two different chapters! On phrase from Luke’s version – the part about letting the oppressed go free? It’s from Isaiah, chapter fifty-eight, verse six! The bulk of Luke’s quote is from Isaiah, three chapters later! Sixty-one, verses one and two! More or less! ”The spirit of the Lord God is upon me,” – check √ – “because the Lord has anointed me;” – check √ – “he has sent me to bring good news to the oppressed,” – check √ – “to bind up the broken-hearted,” – that one’s missing – “to proclaim liberty to the captives,” – check √ – and release to the prisoners; – that one’s omitted, as well – “to proclaim the year of the Lord‘s favor” – and check √ . What Luke says Jesus read, that day, in the synagogue? Well, it isn’t, exactly, like what we’d read. But it’s not all that different, either. And I was ready, once again, to move on to something else. But as I was looking at the verses in Isaiah, I noticed something else. The verse didn’t end there! In Luke’s version, Jesus says he was anointed, he was sent, to proclaim the year of the Lord‘s favor. Period! End of sentence! In Isaiah, there’s, actually, a comma! The prophet is anointed, sent, to proclaim the year of the Lord’s favor – comma – “and the day of vengeance of our God”! “AND the day of vengeance of our God”! But Jesus doesn’t read that! He omits it! He overlooks it! He ignores it! And unlike the other minor differences, this one… this one changes everything! “The Lord has anointed me and the Lord has sent me – among other things – to proclaim the day of vengeance!” The day of revenge! The day of retribution! The day of paybacks! And Jesus doesn’t go there! And that’s important! That matters! It’s not just what he says! It’s what he doesn’t say, as well! Jesus comes back home to Nazareth! He goes to the synagogue where he’d been brought up! They hand him a scroll to read from! 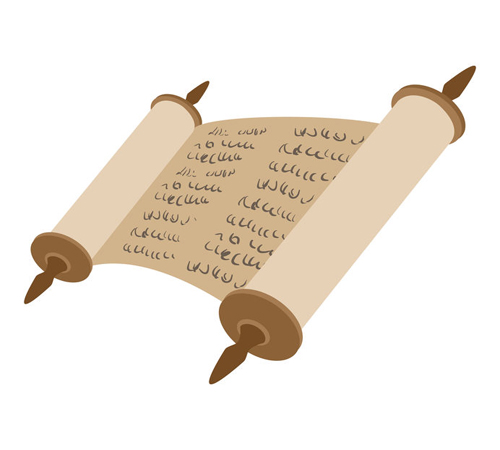 A scroll of Isaiah! He opens it and he says, “The Spirit of the Lord is upon me, because he has anointed me to bring good news to the poor. He has sent me to proclaim release to the captives and recovery of sight to the blind, to let the oppressed go free, to proclaim the year of the Lord’s favor.” Period! End of sentence. He rolls the scroll back up, gives it back to the attendant, and like an exclamation mark at the end of it all, he sits back down. From what he reads, there’s only one meaning. God has come to rescue! God has come to deliver! God has come to save! No ifs! No ands! No buts! No threats! No ultimatums! “God has anointed me,” says Jesus, “God has sent me, to bring life!” Period! End of sentence! That’s what Jesus gets from Isaiah! No ax at the roots, like in John’s preaching! No winnowing fork in hand! No fire! hungry! Unquenchable! And that’s important! Jesus isn’t the baptizer! That’s what Luke’s been trying to tell us, all along! There’s no wrath! There’s no retribution! Only faith! And hope! And love! Especially the love! Luke’s story of Jesus isn’t about being saved or being damned. It’s about the lowly being lifted up! It’s about the hungry being filled! It’s about the blind receiving sight and the lame walking and the lepers healed and the deaf hearing and the dead raised up and the poor receiving good news! About even Samaritans becoming heroes! Throughout Luke’s good news, Jesus does exactly what he said he will do, that day in the synagogue in Nazareth! He proclaims recovery and he proclaims release! What he doesn’t do is proclaim a day of vengeance! A day of wrath! In Luke, there is no outer darkness! In Luke, there is no fire, no smoke! It’s important! To know what Jesus said! To know what Jesus says! And to know what he didn’t! What he doesn’t! This week, it’s water-into-wine all over again! Jesus didn’t change wine into water. He didn’t shame the bridegroom or the steward or the slaves! For running out of wine! For the fact that those six stone water jars for the rites of purification had nothing in them! He, simply, gave life, and gave life abundantly! He didn’t give ‘em hell! For that matter, he didn’t give ‘em heaven, either! He gave them wine! Warming their hearts! Making them one! Contrary to popular opinion – and contrary to all the times the church has reinforced, has confirmed that opinion – Jesus didn’t come to condemn the world! And the church isn’t here to doom it, either! Jesus came – and we are here – to save it! To raise it up from the earth and from the ashes and from the dust! To love it and to forgive it and to make it alive! We’re here to fill it with water and to draw out wine! We’re about fresh starts and second chances and new beginnings! As a congregation, if we are about anything, we are about that! So, for now, take a moment, and look around you. In a few moments, we move to a new place. To a place we’ve never been before. Proclaiming what Christ proclaims! What Christ was anointed, sent, to proclaim! Love! Life! Good news to the poor! Release to the captives! Sight to the blind! The year of the Lord‘s favor! To each and every! To one and all! Without a hint, without a trace, of sulfur or brimstone! With only the aroma of water transformed into wine! My friends, breathe deeply! Fill your lungs! This is what a new day smells like! And this – THIS – is how a new world begins!